Goodbye Jason Bourne. Hello Aaron Cross. Right there, you can see part of the problem with The Bourne Legacy, a semi-successful attempt to perpetuate a franchise with Jeremy Renner taking over for Matt Damon. Renner plays Cross, one of nine chemically enhanced Treadstone operatives. He’s like Bourne, but he’s not Bourne. Damon’s absence can’t help but be felt because we’ve come to identify the Bourne movies with (here’s a shocker) a character named Bourne. 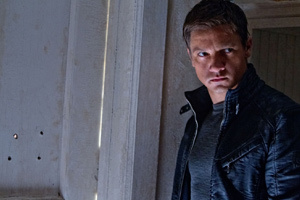 Familiar from The Hurt Locker and more recently from Mission: Impossible - Ghost Protocol, Renner is an explosive actor. He looks and acts tough enough for a globe-hopping thriller, and in this outing he has a snub-nosed intensity that makes him a credible action hero — if not a franchise figure. We meet Cross while he’s conducting a solo training exercise in Alaska. We quickly learn that he’s a super-operative who can go one-on-one with a snarling wolf. We also discover that he’s being hunted by his own super-secret agency, which — thanks to threat of exposure and possible public outrage — is being closed. That means that Cross must be killed, a project that’s being led by a retired Air Force Colonel played by Edward Norton, who — like every other actor in the movie — spends most of his time looking seriously grim. Norton’s character is a proponent of the notion that some things are morally reprehensible but essential to U.S. security. In a dirty world, survival depends on playing dirty. That’s where guys like Bourne and Cross come in. The plot eventually contrives to bring a fleeing Cross into contact with a scientist (Rachel Weisz) who has been working on the project that develops the chemicals that give Treadstone agents their heightened powers. Cross and Weisz’s Dr. Marta Shearing spend the rest of the movie trying not to be killed. Blame recent events — shootings in Colorado and Wisconsin — but for me, the most disturbing scene in the movie involves a shooting in a lab. It’s staged for maximum impact by Gilroy, who directed and wrote Michael Clayton and Duplicity. What makes the lab scene so horrific is that there’s no hail of bullets: A gunman picks off his victims one by one, each shot ringing with chilling clarity. Gilroy does a decent job with the rest of the action, but a lengthy motorcycle chase in Manila — the film’s climax — leans toward the outrageous and makes it clear that Gilroy and company are making a summer movie with a capital “S.” The longer the chase went on, the more it smelled of pandering to me. The movie’s ending isn’t especially satisfying, leaving one with the impression that the filmmakers have huffed, puffed and blown down a lot of houses without getting much of anywhere. The series, we suppose, is meant to continue. Audiences should find enough action and exoticism in Bourne Legacy to give it box-office life, but I wonder whether future movies will continue to put the Bourne name into the title, will let Cross move forward under his own banner or will switch to one of the other agents that are running around the dangerous world that novelist Robert Ludlum imagined when he created the Bourne series. The Cross Ultimatum? Doesn’t sound right, does it?